Any chance I get, I love to eat my food with my hands. Bacon? I eat with my hands. Scrambled eggs? Piled on toast and eaten with my hands. I have been known to eat gooey, rich chocolate cake with my hands and no one can convince me otherwise that it doesn’t make for a more joyful experience. (You people and your cutlery-for-pizza ways? I do not understand you.) 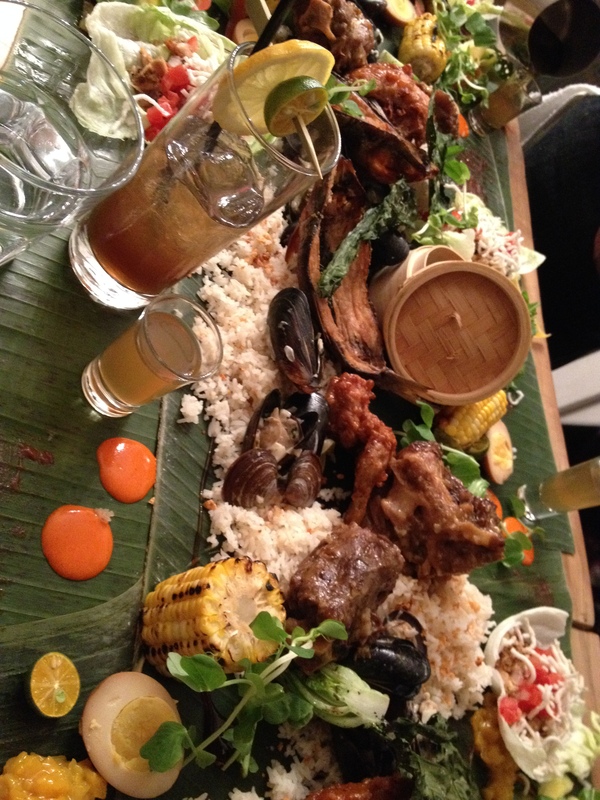 So when I was invited to take part in a kamayan dinner at Lamesa last night, I was genuinely excited. 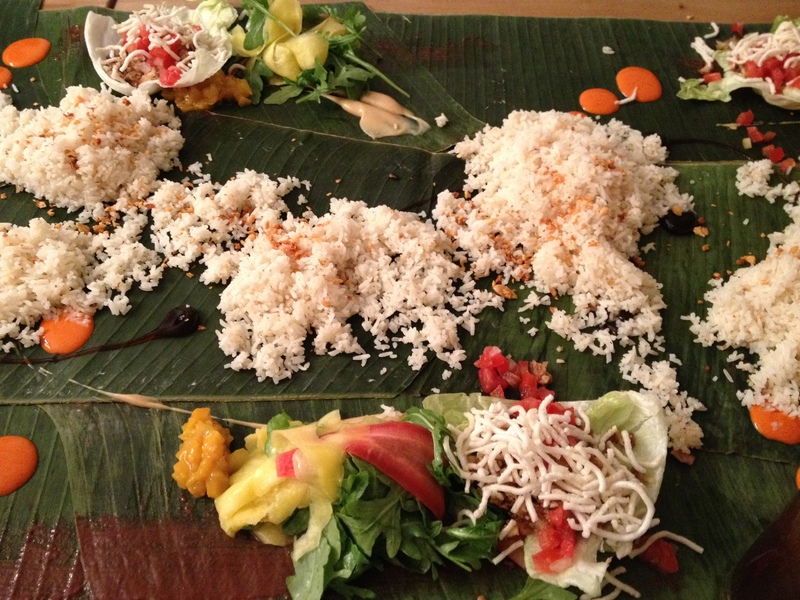 Sitting down at a table draped with banana leaves and eventually adorned with brightly coloured, intensely flavoured food is my idea of a great dinner. 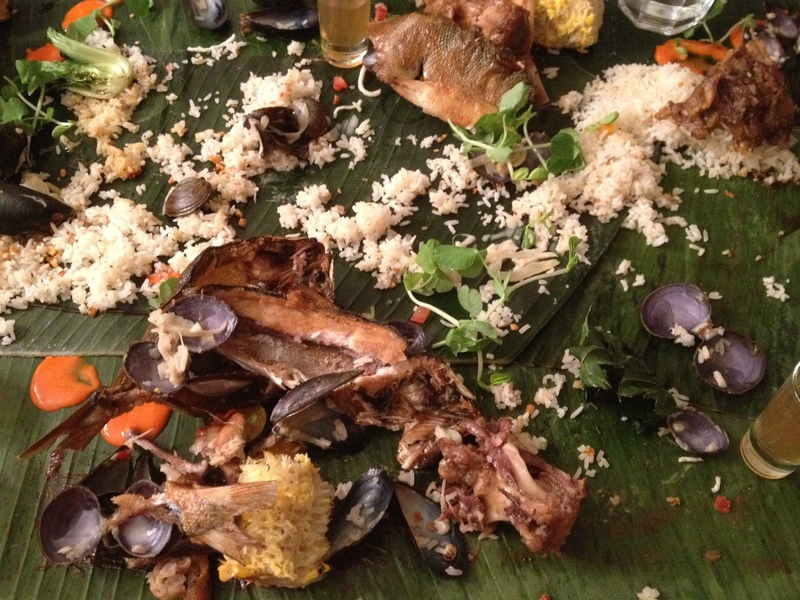 Every Sunday, Lamesa is offering this kamayan (translated, means “hand to mouth”) dinner for a very reasonable $40/person that would be great for everyone: a group of friends, a family, a date. Best to make reservations and to know that this is not a fast meal: the idea is to sit with those you care about to share and enjoy a meal together. It’s a Filipino tradition that the owners and chefs want to bring to our awesome city and I think it’s a fabulous addition. It’s a feast for the senses. 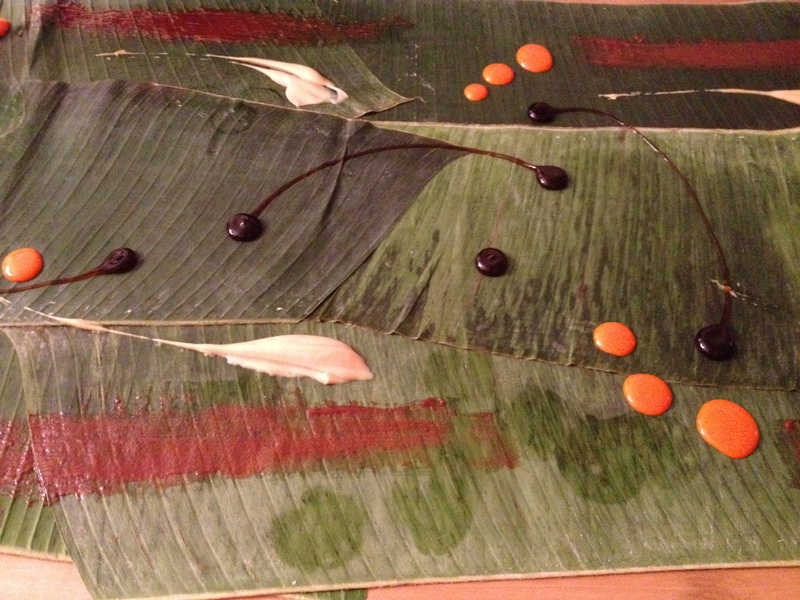 Refreshments in hand, our table watched (and drooled) while head chef Rudy Boquilla and chef de cuisine Joash Dy elegantly placed the four different sauces on top of the banana leaves. First was the bagoong caramel, a fermented shrimp paste, followed by a soy garlic puree, sawsawan gel and housemade hot sauce. The sawasan gel was a table fave: thick, sweet and salty, it was made with soy, vinegar and garlic. Every once in a while, I would find another little pocket of it hidden under rice and I’d swipe whatever bite of food I had in my fingers through it. They could bottle and sell this stuff. 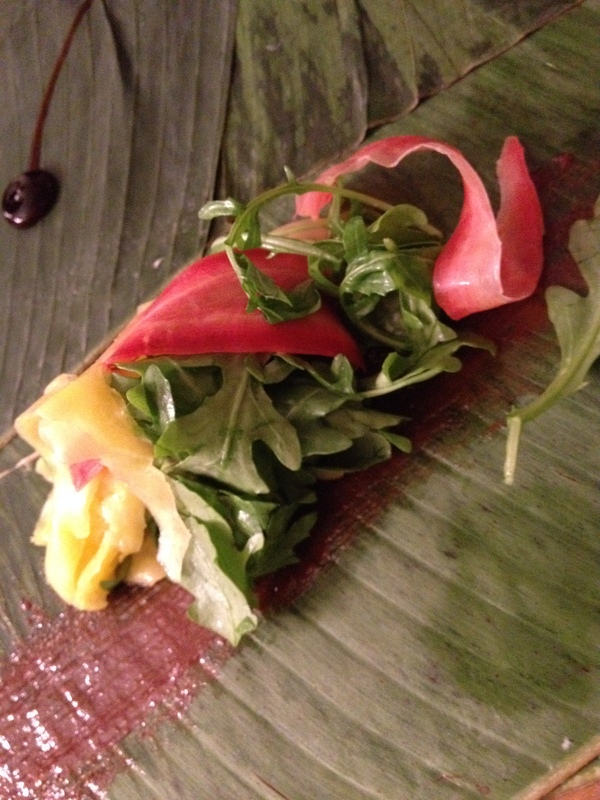 Next to be served was a salad comprised of sour mango, arugula, radish and pretty heirloom carrots paired with mango chutney. This was followed by a sisig lettuce cup: iceberg lettuce piled high with chopped chicken, pork and beef cooked with chili, garlic and onions. Light and crunchy, these were light bites that helped to balance the rich meats that were to come. In the middle of the table, chef Dy spread out generous heaps of garlic fried rice topped with crispy garlic bits. On top of the rice, mussels and clams cooked in a broth of coconut milk, ginger and garlic. 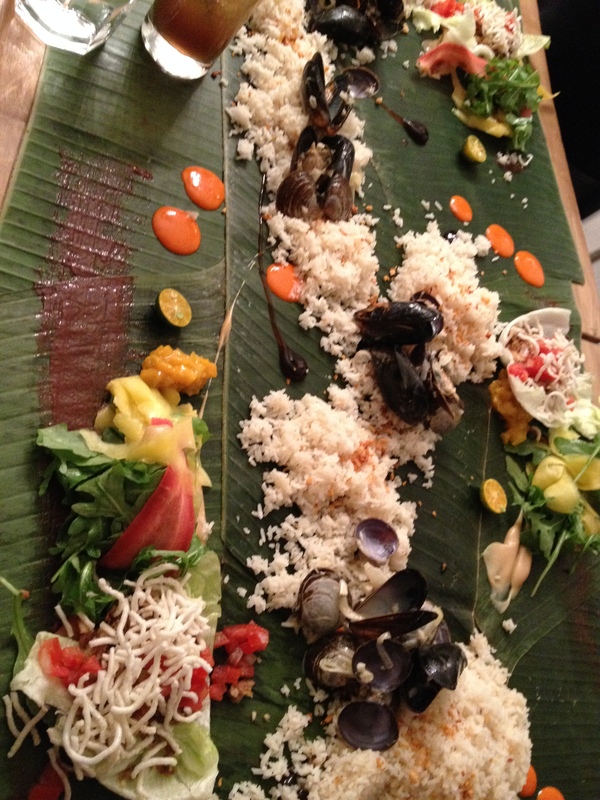 In between the shellfish, smoked, boneless bangus (marinated milkfish) were artfully placed. The smokiness of the fish and the brininess of the shellfish were making our mouths water. Next to come was the hands-down winner of the night: the crispy chicken adobo wings. This is not to say that the kare kare oxtail (braised in a peanut garlic sauce) wasn’t succulent and beautiful, because it was; but, this chicken was incredible. Maybe the best fried chicken in the city. A grand statement, to be sure, but it has to be tasted to be believed. The array: smoked fish, mussels, corn, oxtail, chicken adobo wings, rice, kale chip, pea shoots, lettuce cup and chicken tinola broth. 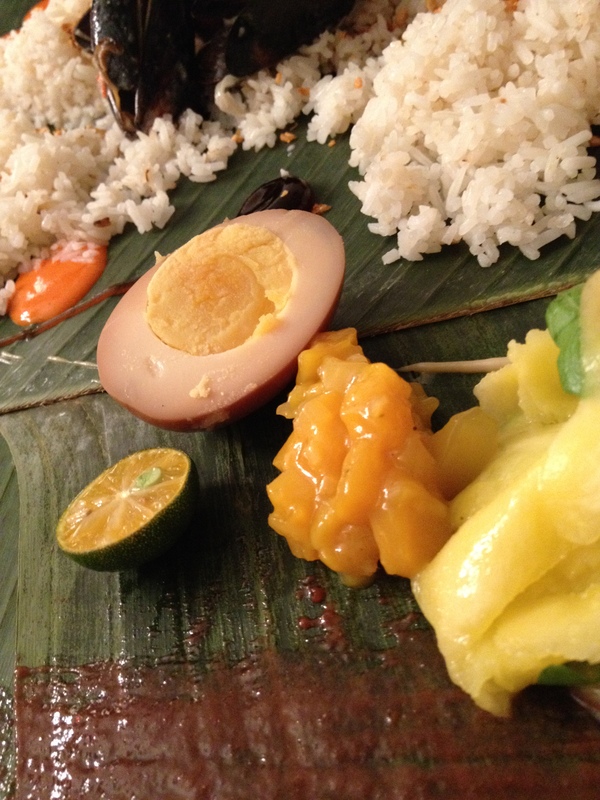 Halved calamansi, pickled egg and mango chutney. Not to be left out were the grilled corn, bok choy, kale chips, sweet purple yam cornbread, pickled egg and fresh calamansi that dotted the table. To say this was an epic meal would almost do it a disservice. It was a fun meal. A balanced meal. An “I am so full but can’t stop eating” meal. An “oh my god, did you try this with that? ?” meal. A meal one does not soon forget. 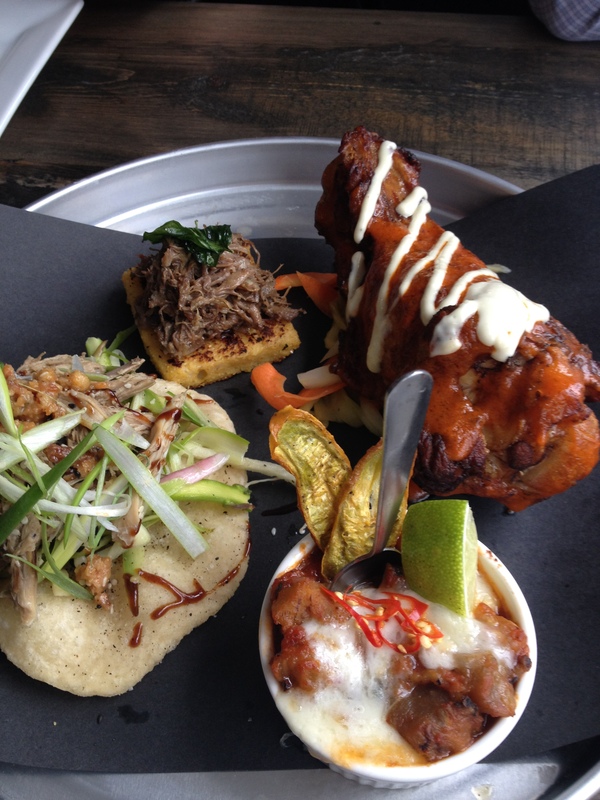 Check out Lamesa at 669 Queen St. W., just west of Bathurst. 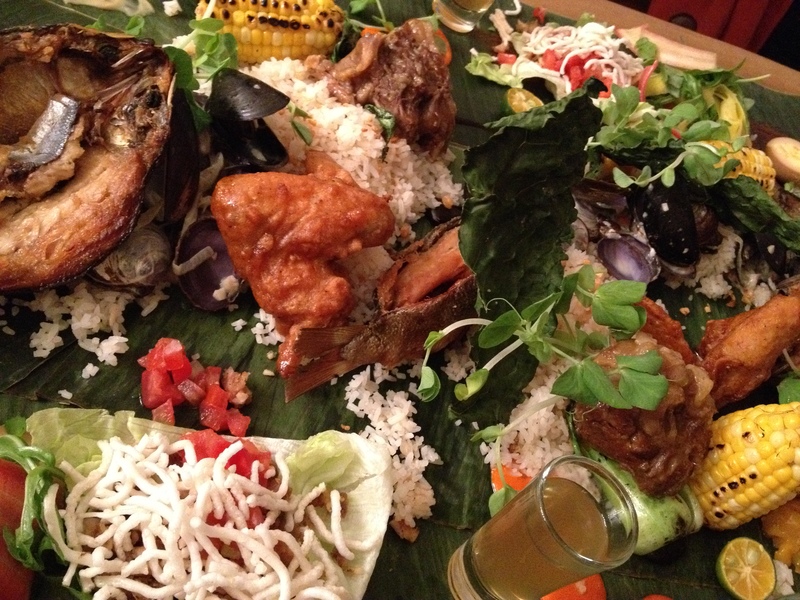 They will be putting on the kamayan dinners every Sunday night – don’t forget to make reservations! Matt Basile can fairly be called a bundle of energy. In less than two years, he has gone from tables at 99 Sudbury to pop-up events around the city to owning a food truck to opening a restaurant. Oh, and let’s not forget shooting a TV show for Travel & Escape, documenting this whirlwind. You knew Matt, a.k.a. Fidel Gastro, was at an event when you heard the boisterous cries of, “OLÉ!” and when you spotted the omnipresent Elvis bust. 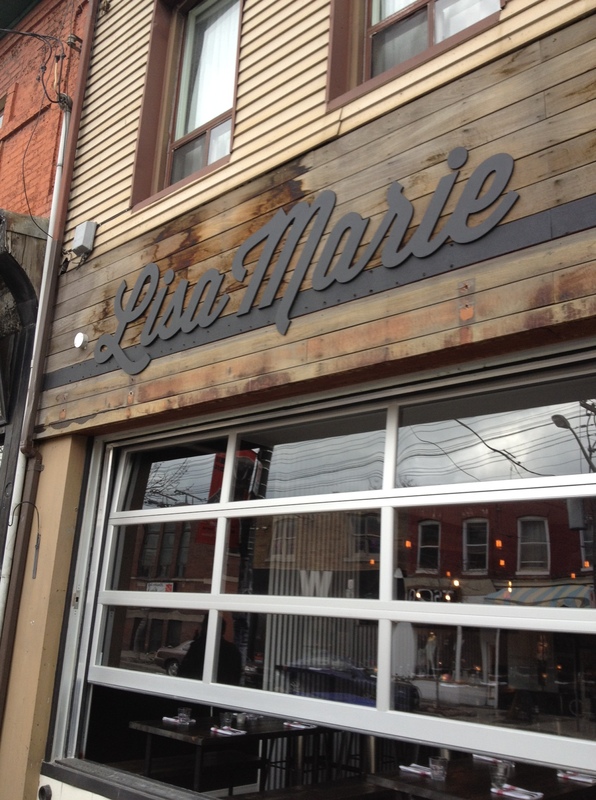 Between his enthusiasm and his tasty sandwiches, it is no surprise that Matt has fast-tracked his way to opening his restaurant, Lisa Marie (638 Queen St. West). 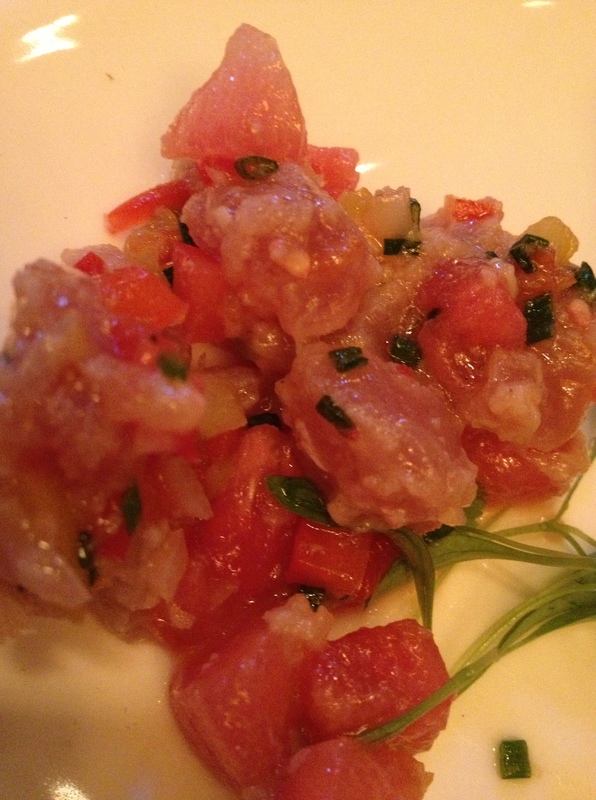 The menu is comprised of cichetti – small dishes enabling you to try lots of options – and a couple of specials. I went with two equally hungry friends and we decided to order the entire menu, plus one of the specials as it sounded too good to resist. We asked our waiter, Chris, if we were being too ambitious; he asked us to put our trust in him and told us he’d take care of us. If we were getting too full, just let him know and we’d skip right to the special. The first round of food consisted of: beer-braised short rib on polenta, brined eggplant with tallegio cheese and chili peppers, the (MASSIVE) turkey wing done in a buffalo style and the deep fried pizza with smoked duck and enoki mushroom and asparagus slaw. 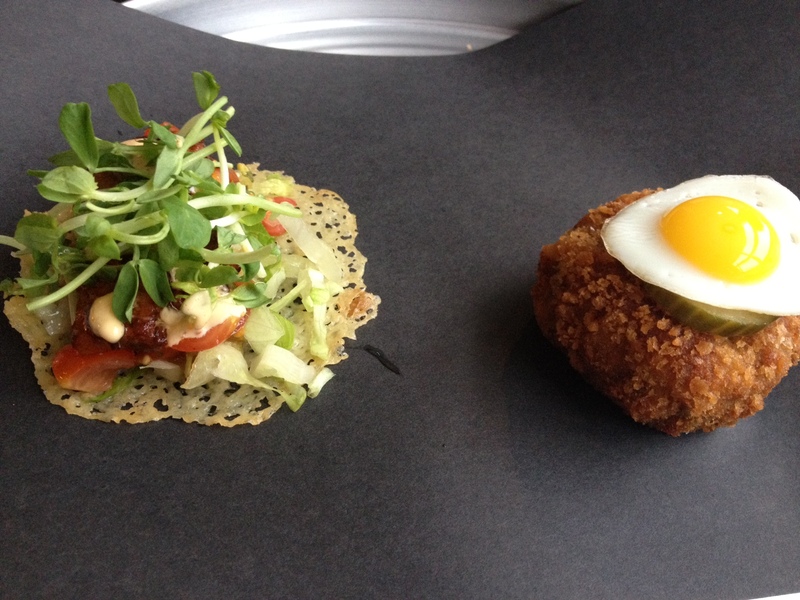 These two dishes were even better than the first round. 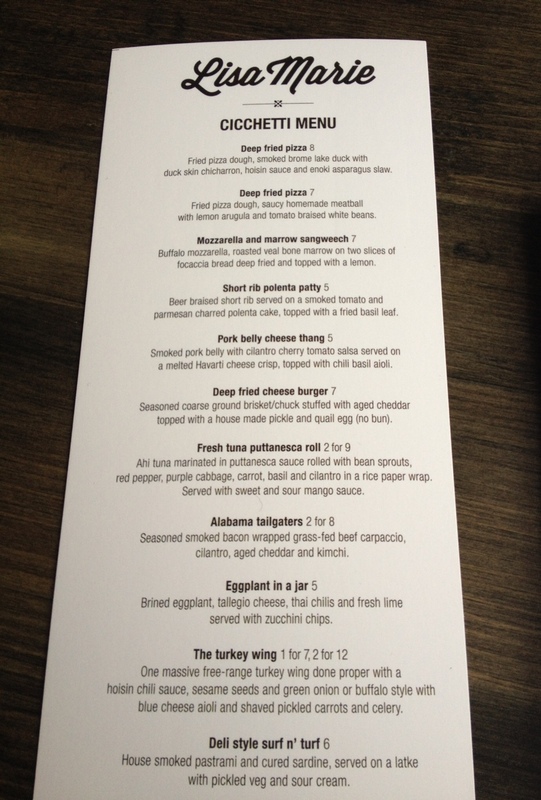 I mean…one has pork belly, so…sold. The other is deep-fried brisket and chuck and is topped with a runny, gooey egg. Do not pass these up! On the left is the fresh puttanesca tuna roll: ahi tuna marinated in a puttanesca sauce and rolled up in rice paper with a variety of fresh vegetables. 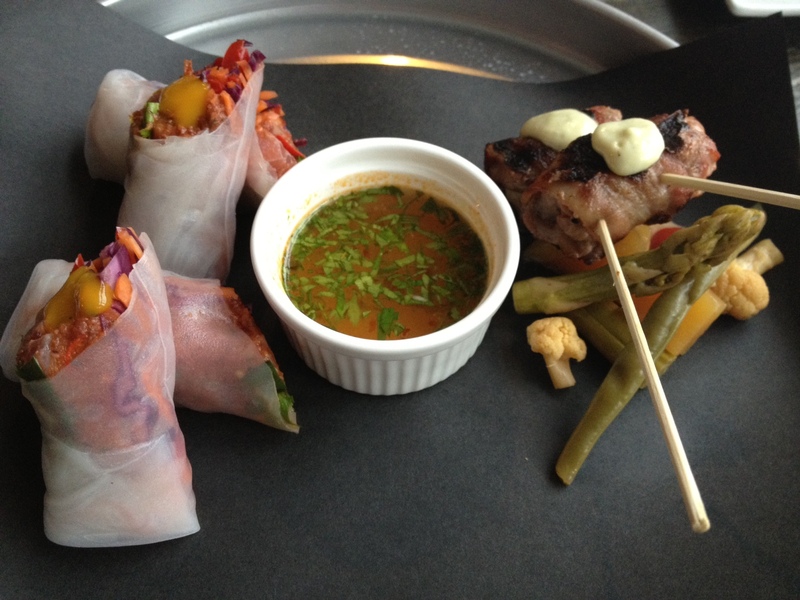 Crunchy, light and full of flavour, the rolls are finished with a sweet and sour mango sauce. This sauce was so good one of my tablemates drank the whole thing. On the right…oh my. These puppies are nuggets of bacon-wrapped beef carpaccio, cheddar and kimchi on top of pickled vegetables. I’ll let that sink in for a moment. Do. Not. Miss. These. Only because we knew we had more food coming did we resist ordering another round or six. 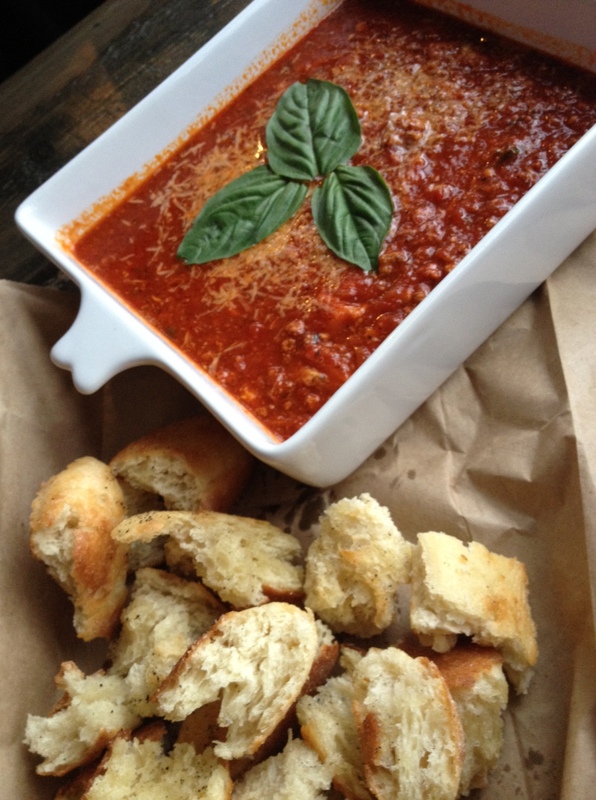 Homemade, fresh tomato sauce with bison and pork and a bag of warm, torn, salty bread. Simple, fun, delicious. We ripped open the bag and went to town on this one. 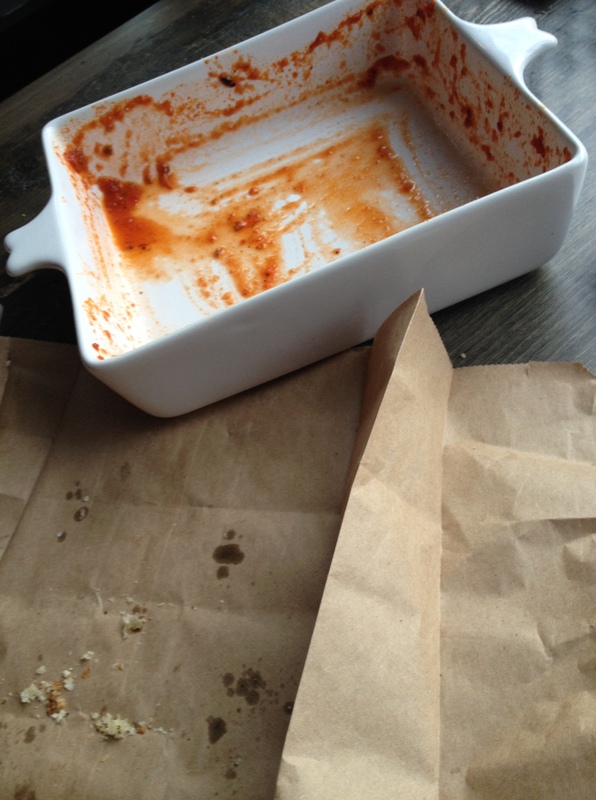 We plowed through two bags of bread and polished off as much as humanly possible. The sauce was light and flavourful. I want this recipe; but, I suspect I will be out of luck so I will just have to order it every time I go. And I will. I strongly suggest you do, too. I encourage you to check out Lisa Marie. 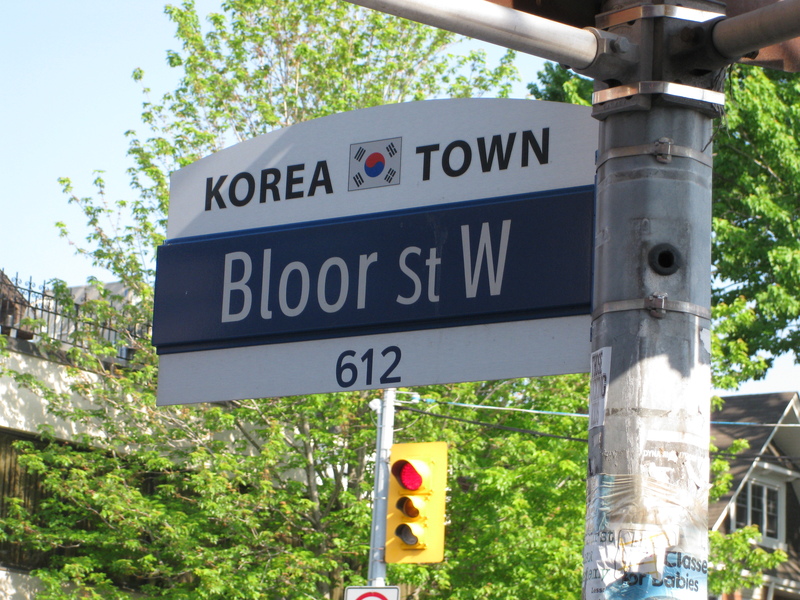 It’s a cool place – with a little market in the back where I picked up some kimchi and bacon jam – that boasts a fun, boisterous vibe. They are taking limited reservations and I would bet Matt will be kept very busy. I doubt he’d have it any other way. There have been a whole lot of changes going on in foodNURDland, not the least of which is the ever-closer arrival of the foodNURDling in December. As someone who loves food – and many, many of the alcoholic beverages under the sun – this has required some alterations in my normal routine. It was not easy to give up some of the foods and drinks I love. Prosciutto, wine, raw fish, tiramisu, beef (steak, at least. I am a firm believer that beef should not be cooked to more medium rare at most, so that’s pretty much out, too) and beer. While I’ve chosen to have a little bit of wine here, some beer there, I’m obviously no longer unwinding after a long day with a glass – or two or three – of cab sauv. And what’s a wine-loving woman to do when she goes out with friends for dinner and can’t face another ginger ale or glass of water? She asks the bartender to get creative. The easy option is a virgin mojito. All the bartender has to do is remove the rum et voila: drink. In my experience, though, virgin mojitos are far, far too sweet. 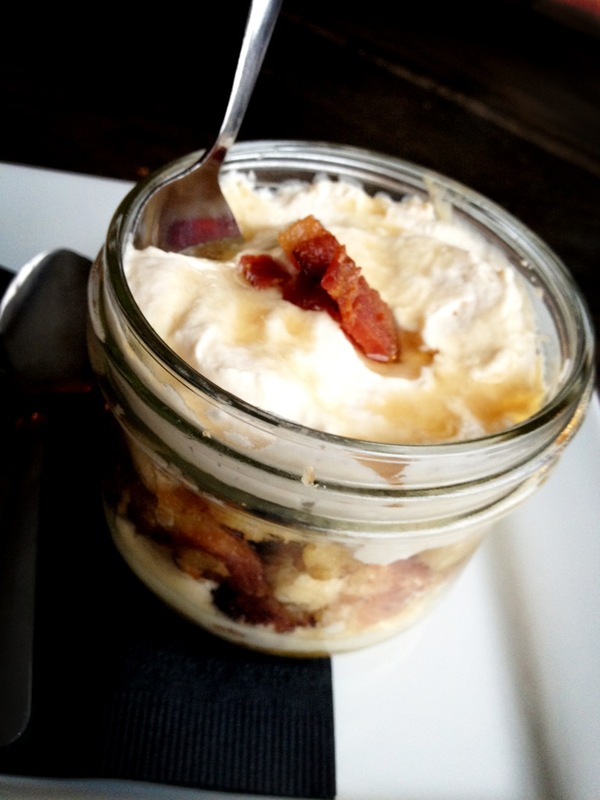 J makes a much better version than any I’ve had at a restaurant: it’s nowhere near as sweet. My girlfriend, the Hot Biscuit, doesn’t drink much and her tasty stand-by is a mix of cranberry, orange juice and 7-Up. It’s definitely sweet, but the cranberry juice’s tartness helps. 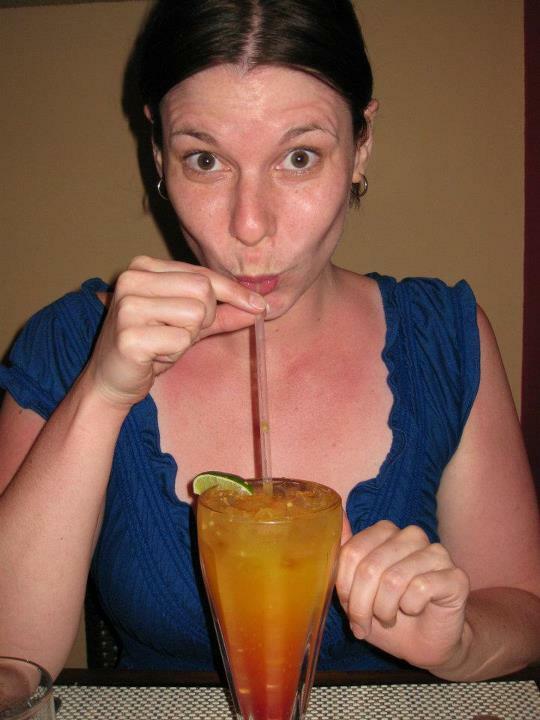 The most entertaining drink I’ve had so far? 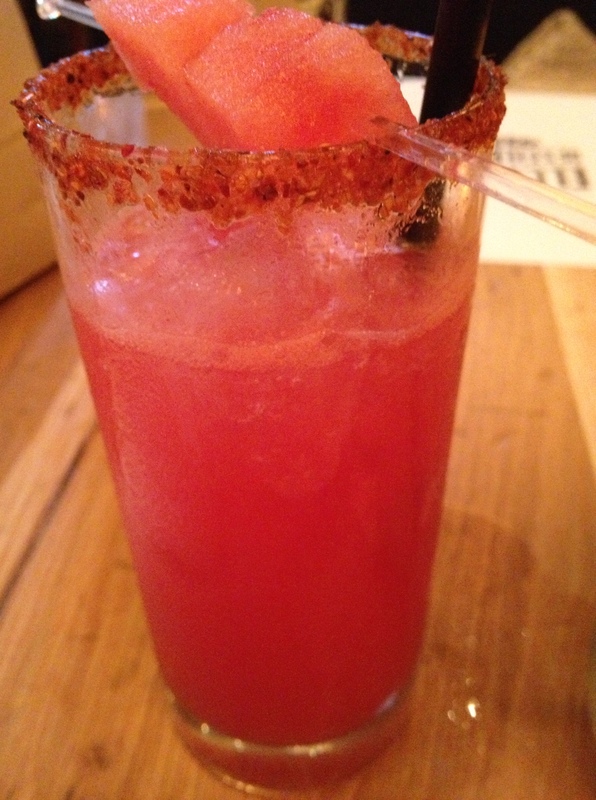 A Shirley Temple, made for me at Salvador Darling. The bartender seemed a little stumped initially, so I suggested she just throw some orange and cranberry juice in a glass. Seconds later, it was like a light bulb went off over her head: “I can make you a Shirley Temple!” Awesome. I haven’t had a Shirley Temple since I was ten. 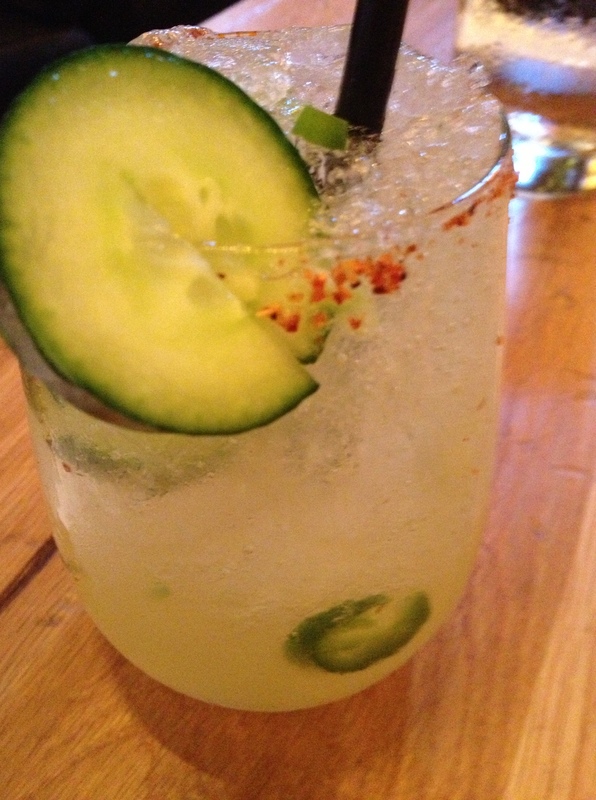 I was asked repeatedly if it tasted like I remembered and it pretty much did: sweet, a little fizzy and…sweet. 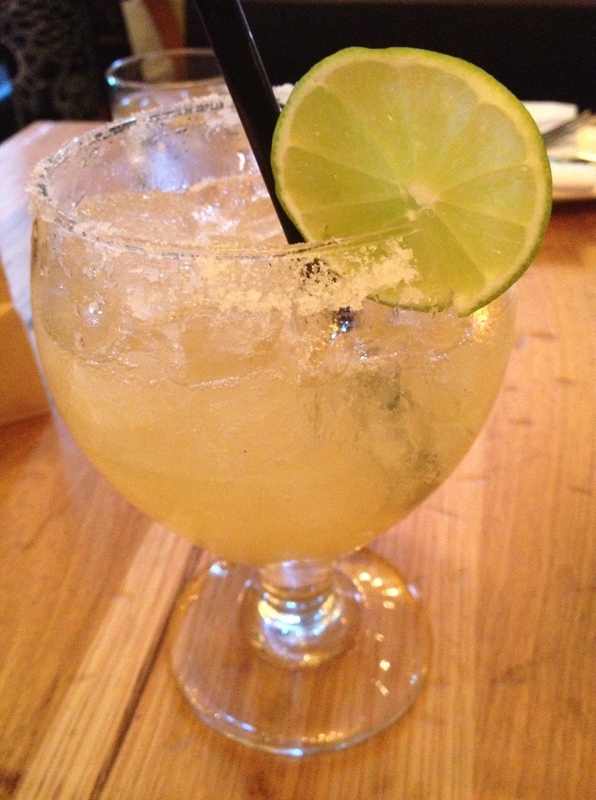 A tall, frosty glass of tastiness arrived in front of me a few minutes later. Filled with ice, mint, ginger, homemade lemonade and a couple of other delicious ingredients, this was pretty much my perfect (non-alcoholic) drink. It was refreshing, not overly sweet, and complex. I’m hoping to be as pleasantly surprised elsewhere as I was that evening but so far, still searching. Anyone have any suggestions for a great drink or bar? This is the second in a series of monthly posts about some of my favourite smaller spots in Toronto. I love getting to know the people behind the great food we have in this city! Having been here before, and after talking to numerous people who have as well, I couldn’t argue. The sides are especially great: the kimchi, pickled cucumbers, bean sprouts and spicy pickles are all made expertly, with a nice crunch. 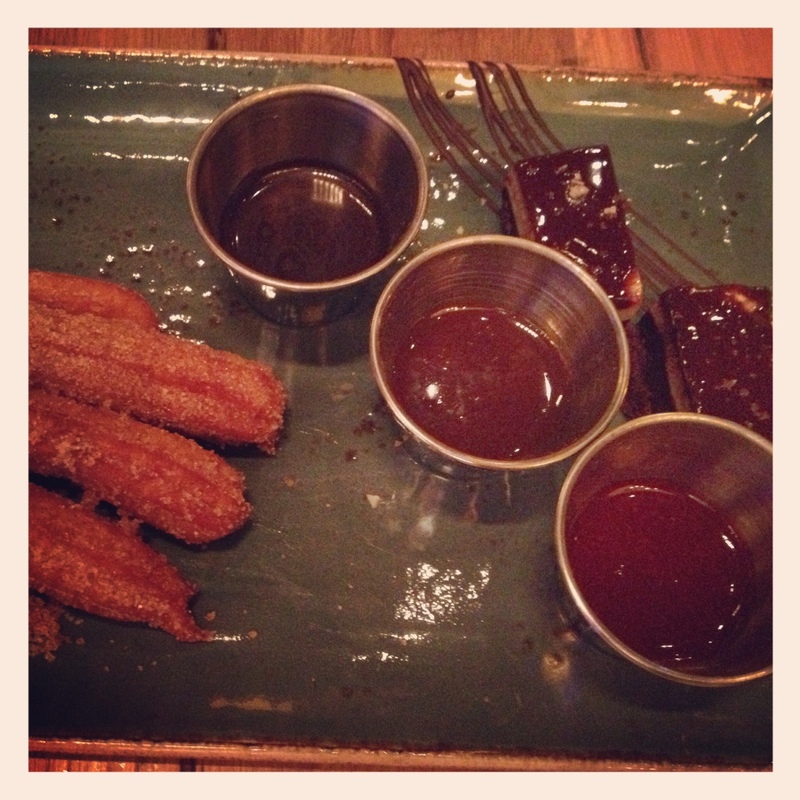 If you order the bbq platter – and I recommend you do. It’s leaps and bounds above the chain Korean bbq spots – all these sides will come with it and they are a wonderful accompaniment. Fabulous – and partially eaten – side dishes. The kitchen takes a lot of pride in their dishes and make just about everything by hand including the outstanding dumplings. Do not miss these lightly fried delights, stuffed with beef, green onions and various spices. Other specialties of the house? 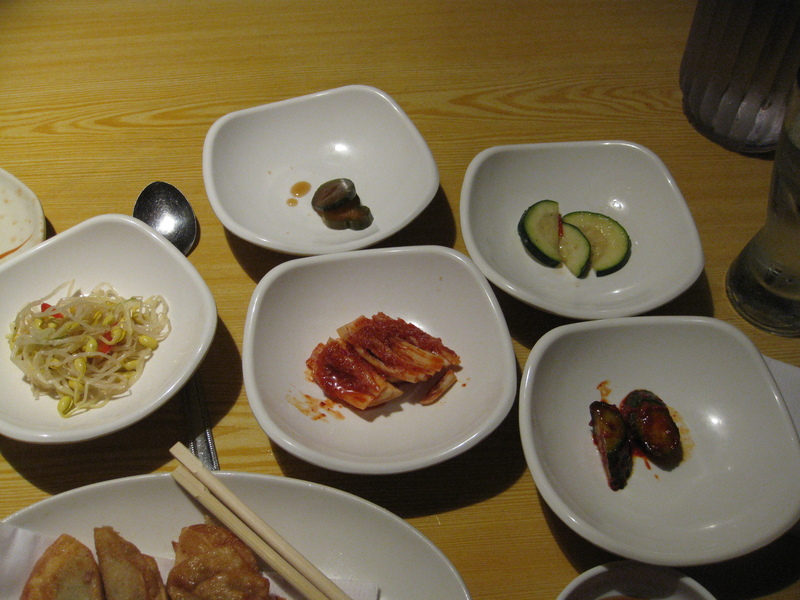 “I often recommend the bibimbap and sweet potato noodles,” Jason explained. Both are traditional dishes and you could certainly do worse. I happened to love bibimbap and I will certainly be trying this the next time I go. 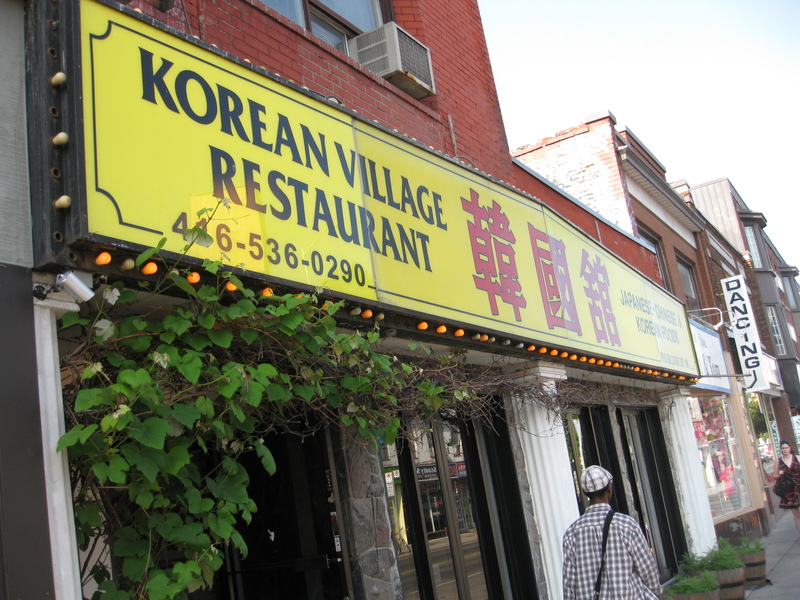 I have no doubt that most other restaurants in Korea Town have many of the same dishes but going to Korean Village Restaurant is such a fun experience, one that Jason, his parents and the entire staff works hard to maintain. I have heard stories of first dates, business dinners, late-night-not-entirely-sober-drop-ins and massive groups all showing up at the restaurant, all to be shown a great time with delicious food. 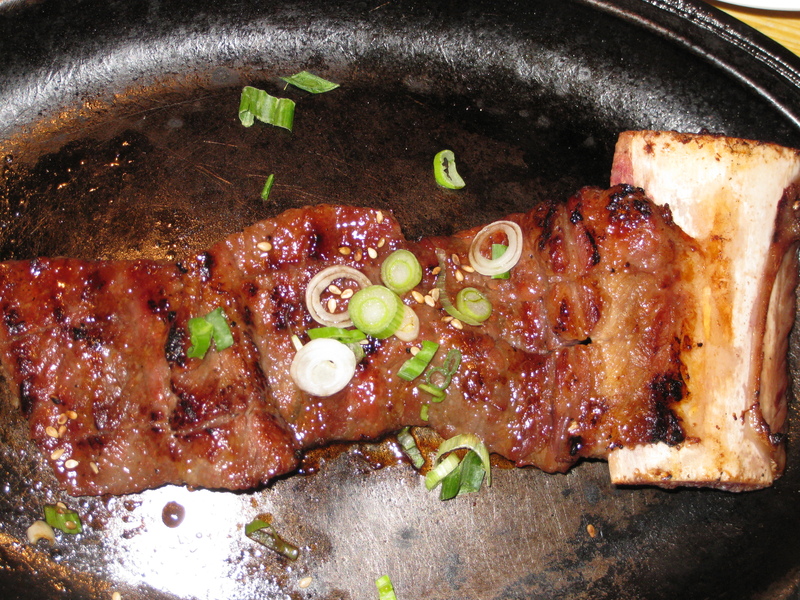 I do not pretend to be an afficionado of Korean food, but I know what I like: I like great food and great service. I have found both in spades here. Both Jason and his mother are gracious hosts who genuinely want their guests to enjoy themselves. “My mom told me to be a hawk,” explained Jason. “Pay attention to the details.” Clearly, he and Korean Village Restaurant have taken this to heart. Like this post? Check out the first Spotlight Series article! In the last couple of months, J has become friends with one of the wait staff at Centro. Trevor has been insisting that we come in one night to check it out; that we were missing out on a great dinner; that we’d be well taken care of. After a few weeks, we decided we had nothing to lose (except the ability to fit into our pants, apparently) and made a date to check it out. We walked into the high-ceilinged, heavily-mirrored dining room and were appropriately agog. 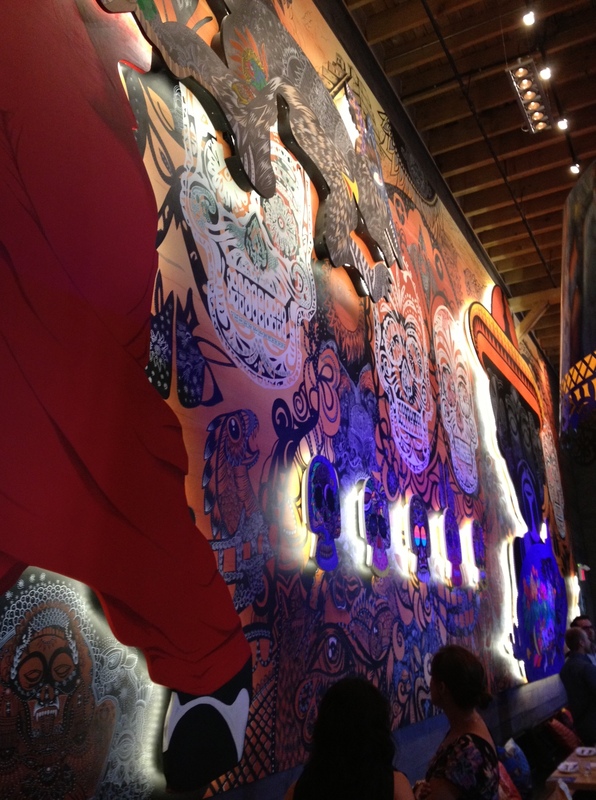 The room manages to be at once cozy and grandiose. We were shown to a corner table with tall banquette seating with a great view of the dining room. We watched the waiters practically dance around the tables, expertly serving their well-attired clientele. Trevor greeted us, took our drink orders and told us to sit back and relax. Since we’d be having the chef’s tasting menu, all decisions were out of our hands which was just fine by us. My only request was no olives, please. (I have a well-documented hatred of them. I have tried them a few times and I just. Can’t. Do it.) Three hours and seven courses later, we walked out two happy and very full customers. Two separate starters arrived at our table to begin: piping hot arancini stuffed with pesto risotto and buffala mozzarella, sitting on tomato chutney and a beautiful charcuterie plate with boar salami, guanciale, prosciutto, pate, rye crostini and pickled vegetables. Both plates were stunning to look at and had our mouths watering for more. Following the opening dishes were colourful plates of pickled beets topped with that same creamy buffala mozzarella, pesto and light, crunchy bread tuiles. Light and refreshing, this was a great follow-up to the heavier course before it. Two courses down, five to go. (Not that we knew how many courses were headed our way. Just that we were going to eat. And eat. And eat.) Next up was perhaps the most delicious scallop dish I have ever had. A single seared scallop in a Meyer lemon sauce, topped with capers and brioche crumbs. Incredible. The sweetness of the scallop was offset – but not overwhelmed – by the briny capers, sharp lemon sauce and the crunch from the bread all came together in a few perfect bites. The fourth plate? Oh my. This was a gorgeous, rich braised short rib and maple-glazed sweetbreads with crispy leeks, a sunchoke purée and a red wine gastrique. Rich, unctuous, sweet…heaven on a plate. 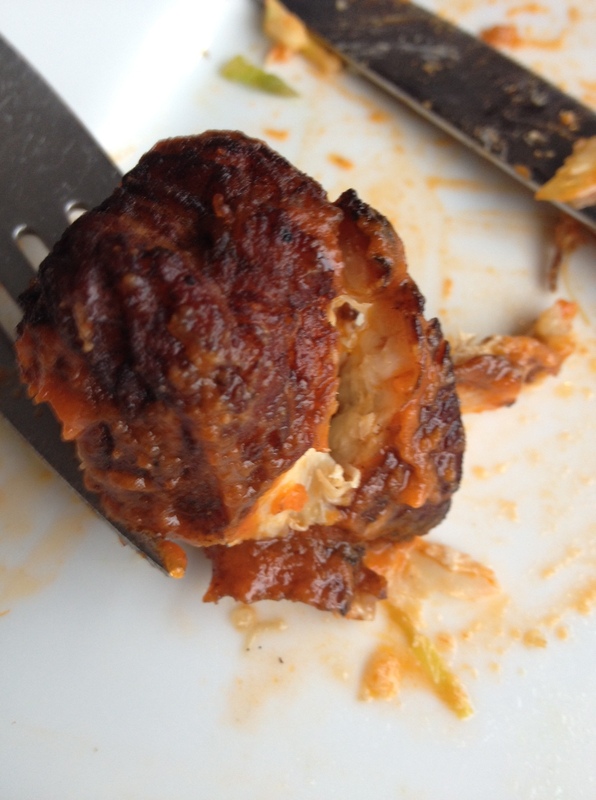 The sweetbreads were absolutely delectable – even J, who was a bit dubious initially, absolutely loved them. They were nice and crispy on the outside and tender on the inside, just as they should be. Folks, if you want to try something a little different, I can’t recommend these enough. Chef Symon Abad knows how to handle ’em. Around this point in the meal – about an hour and a half in – I am thanking all sorts of gods and monsters for not having worn a belt. No one plate was huge, but they were starting to add up. 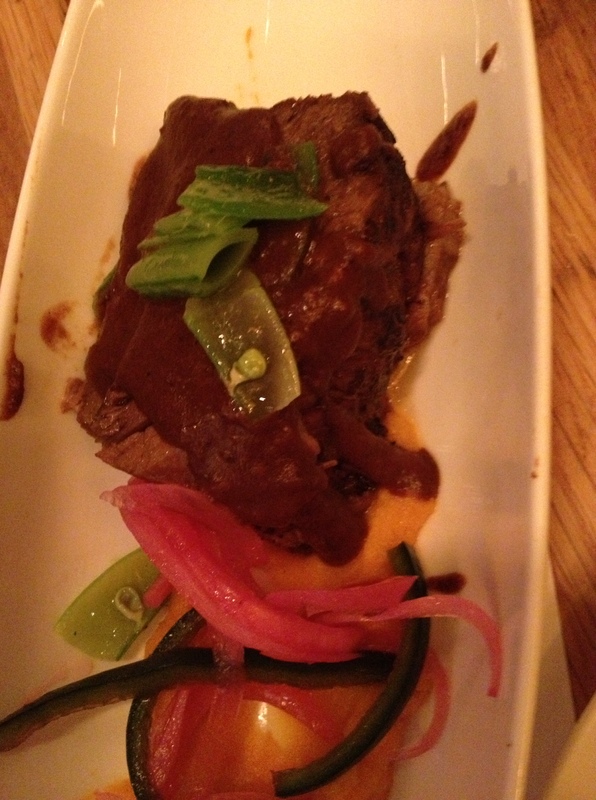 The short rib was wonderfully fatty (not overly, though) and rich. I was thinking that there couldn’t be much more. Like, maybe dessert next? J suggested that there might be pasta on the way, but I just didn’t think that was going to happen. That is, until bowls and seafood forks arrived. Okay. So this was not dessert coming up. No, in fact, it was a lovely pasta course (score one for J!) of squid ink fazzoletti (“handkerchief” in Italian) served with crab, mussels, clams and shrimp in roasted garlic and red pepper sauce. Yes, you read that right. An impressive dish on an impressive evening. “Okay, that’s got to be it, right? 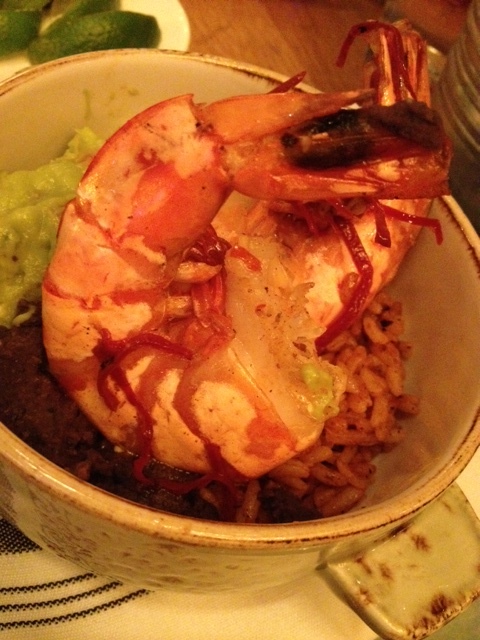 We’ve had meat, pasta, seafood…that’s gotta be it.” I exclaimed. Trevor and another waiter came and cleared away everything but our glasses from the table and I figured that could only mean one thing: dessert. Ten minutes later, forks and sharp knives were placed in front of us. Dear god. Trevor was nearly giddy as he placed veal tenderloin and calf’s liver on potato rosti, red cabbage and pearl onions in front of us as our eyes widened. “Your mains!” he proclaimed. As full as I was, there was simply no way I was not going to try this. The tenderloin was seared on the outside, juicy and just a little pink on the inside. Excellent. I could have eaten four pounds of the potato rosti it was so good. Unfortunately, I’d pretty much hit my wall. I could not have eaten another bite of this rich, tasty plate. J fared better than I but still couldn’t finish. We didn’t want to waste anything so we had what remained packed up. We paid a quick visit to the chef and his brigade to thank them for a fantastic meal. It was nice to, you know, stand up. 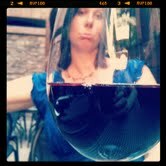 Maybe we should’ve gone for a walk around the block between courses! And what arrived for the seventh and final course of the evening? Two different dishes: a lovely, light, layered cake with rhubarb filling and a plate with freshly-made mini-donuts dipped in maple sugar and served with squash-maple purée and crème fraiche ice cream. Oh my. A fabulous way to end an extraordinary meal. We sat, mildly dazed, sipping ginger tea for a little while, watching the staff clean up for the night, contemplating the past three hours of food extravaganza. A beautiful meal in a beautiful place. The pedigree of chef that’s come through Centro is of the highest quality (Marc Thuet, Michael Bonacini, Chris McDonald…it goes on) and chef Abad upholds the restaurant’s stellar reputation. This is the first in a series of monthly posts about some of my favourite smaller spots in Toronto. 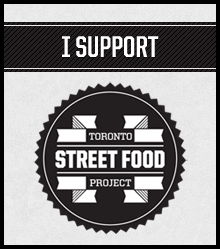 I love getting to know the people behind the great food we have in this city! 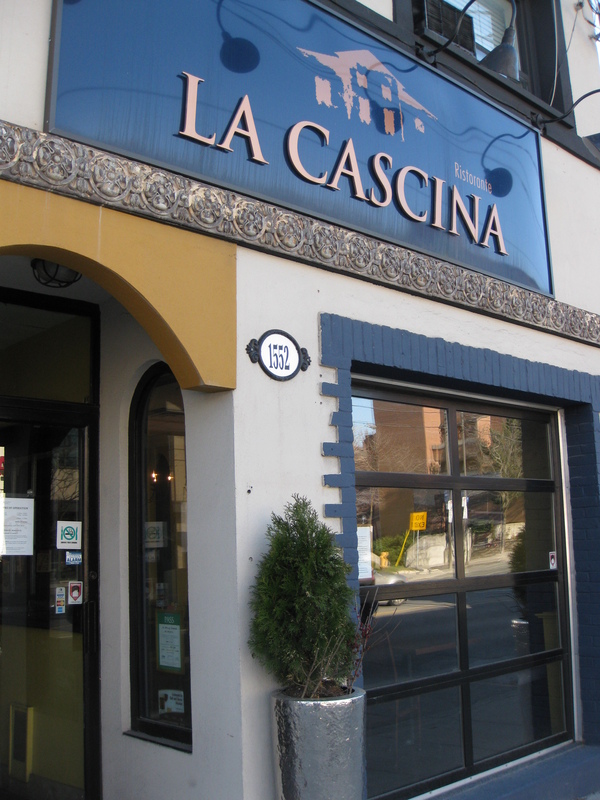 When people ask me, “What’s your favourite restaurant in the city?” my answer is, invariably, La Cascina. Since popping in a couple of years ago for what turned out to be a delicious, filling, relaxing, and surprising meal, J and I have been going back more and more frequently. It’s our go-to for a nice meal. We know we will be treated well by the staff who cater to their guests’ needs without being obsequious nor pushy. It’s the kind of place you go on a date, for a birthday dinner, with family or friends to linger over wonderful Italian food and wine. Recently, I had the chance to sit down and chat with chef Luca and front-of-house manager, Sharifa, to discuss Abruzzo, Toronto and many things in between. Having owned a restaurant of the same name in the Abruzzo, when chef Luca arrived in Toronto he was disheartened to see that the hospitality he worked so hard to achieve back home didn’t really exist here. He found dinner here to be a standard, two-hour maximum affair, with restaurants more concerned with flipping tables than satisfying customers. “In Italy, eating is a passion. We had a ‘destination’ restaurant: people would drive for two hours, arriving in the afternoon for lunch and staying through dinner.” With 15 years in the kitchen under his belt and yearning to recreate this kind of atmosphere, Luca opened a restaurant in Woodbridge with much success. As they are in the current location at Avenue & Lawrence, patrons are allowed to take their time with their meals, enjoying every last bite. What will diners find on the menu? An ever-changing array of beautiful dishes. Cold antipasti platters of cured meats and young cheese; hot bowls of farro, of braised fennel with onions, of roasted zucchini and almonds. Any pasta option they choose will be made to order and will be incredible. There is always at least one meat and fish option and once a month, Luca and Sharifa host a fish and seafood evening (i sapori del mare). These nights feature succulent, well-executed dishes like rich arctic char topped with truffles and briny linguine vongole. I asked Luca what his favourite dish to cook was and it happened to coincide with the first dish he learned to make: pasta carbonara. He spent much time trying to perfect it when he was younger and, as he spoke about it, you could see the passion in his eyes. Already a pretty animated person, he was practically giddy when explaining that what you really needed is a few key elements of the highest quality. It’s not a difficult dish to create; but, to make it excellent, you have to have the best, the freshest, ingredients. “You don’t need cream. There is no cream in this restaurant because people in Abruzzo would never use cream. You just have to make it right.” Indeed – and he does. I had some that night and subsequently told all my friends about it. I returned two weeks later with a girlfriend and it happened to be on the menu. She is not a huge fan of pasta, but my effusive praise had convinced her that she had to try it. We split an order and the look on her face was one I recognized: pure food-induced happiness. A question I love to ask people – especially chefs – is the old, “If you were stuck on a desert island, what five ingredients would you want to have with you?” The chef rhymed off the first three in rapid succession: “pasta, bread and eggs.” After a little further thought, he added truffles and lamb. I, for one, wouldn’t mind being stuck on that desert island if he were there to cook all those things for me. I encourage you all to come to this wonderful restaurant. There is always something new to experience and Sharifa & Luca constantly strive to bring more to the customer. They are budding sommeliers and stock some lovely Italian wines. (A personal favourite of mine is the Nicola Di Sipio Montepulciano 2008.) Come for the atmosphere: meet Sharifa, the ever-gracious and knowledgeable manager. Come for the friendly and warm service. 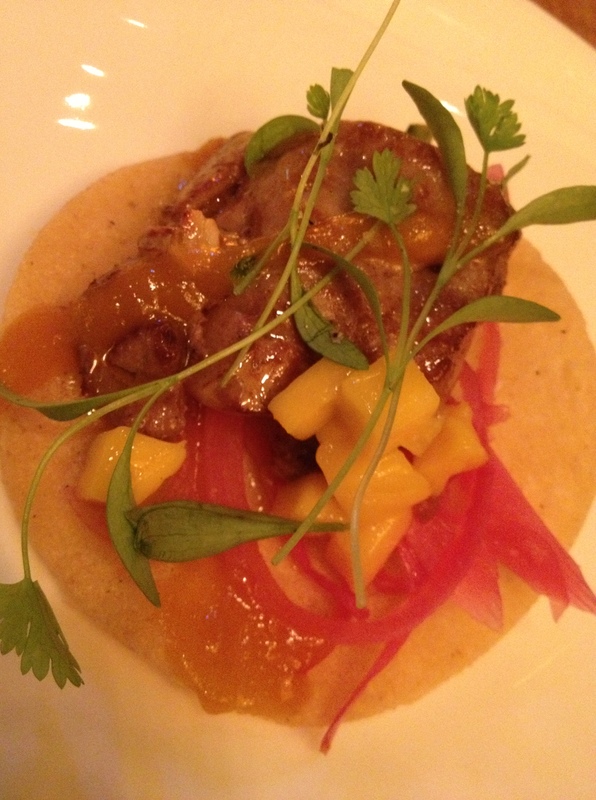 Last but certainly not least, come for the simple but remarkable food. It’s going to make you re-evaluate the other Italian restaurants at which you’ve been eating and may well spoil them for you.